Prolly all pregnant too, and will shell out some bucks for you next year. I put a few apples out last night. I have to start the grain and bread feeding. I enjoy watching them come out. Years ago when times was good here I use to feed them alot more often. My wife has seen 14 at one time. Company enjoys watching them. Seem like a bunch will come and ½ later another bunch would come. Seem like with a full moon they don't like to come out as much. When i go out to feed the OWB I shine the light down there and see eyes. We used to enjoy feeding the deer in our backyard, but then NY State outlawed deer feeding! The brains of the state said that "anything other than natural feeding" was harmful to the deer population! Just grow oaks, corn and soybeans. You will get plenty of deer. The congregation of animals from feeding, salting stations are suspected of spreading some really bad diseases in the deer population. Leastways, that's what I heard. I have plenty of oak for the deer to find arcons. One year they was pawing the ground up around them so much,company was asking me why I was digging out in the woods. Illegal here, but there are quite a few that still feed them! They take their chances and feed at their camps and other places out of site of the road! All of my property is visible from the road, so.... I don't! Nice picture. I think I count ten? now there are tracks everywhere including in my driveway an lawn. cant feed em but had a ton of wild apples and nut mast this year. They been coming back every night, but i think there on shifts now they start coming in around 6:00 in the evening and go untill about 5:00 in the morning. that photo had 8 deer in it thats the most we have had at once. I have one visitor as I post this. More will come as time goes on. I went out around 10 tonight and had 6 waiting for me. I give them night visitors a yollar and they come a running. I just take this picture,Not the best,I took it through the window screen. This was back in 2011,same spot. 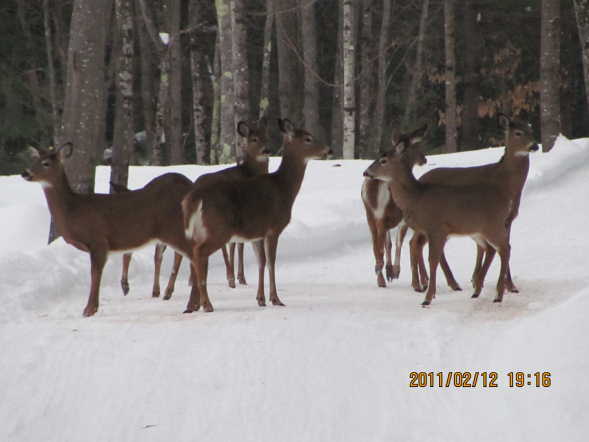 Question: Why do whitetails herd-up in winter? I don't know, maybe security in numbers! I think when snow is deep and they are breaking a trail,they will take turns on the lead. In a deer yard they can keep it packed down so they can get to the food. Sounds good to me. They bunch up for protection. They are tired and conditions are poor. The more sets of eyes there are the easier it is to spot predators. Heres one thats started coming in lately,we have had 11 different deer so far! Still has his horns on. Looks good. No horns here. Nice pic loggah I also noticed that he still had horns. I am curious when they lose their horns in both your area and others. Great pic of a big guy, Don. In our area, they start to shed beginning around the end of January. He probably will be shedding soon! Peter i,ve had 2 different bucks,8 full size does ,and a small skipper so thats how i got that number!! maybe i should start splatting them with different color paintballs !! There is about four of us that is feeding them,no more than a mile apart. I see three of them through the winter. We are always kidding about shotting them with a paint gun to see how many we really have. Years ago when I use to fed them more I bet I would have 40-50 come at diffeant times through the day. Same ones?? I have no idea. At work there was a group that was feeding them. They would get 50 at one time. But come summer time and fall,no deer to really be seen in that same area.